Our target destination was in fact not recognizable from the national highway, with only painted boards of advertisement of some resorts clinging before the road that will inform that you are not too far from the hidden paradise. Habal-habal is the only mean of transportation going to Barangay Britania and the motorized bikes are available beside the waiting shed of the drop-off point. If you found none, just wait until one arrives every 20 minutes. Each passenger has to pay Php20.00 for a 20-minute bumpy ride. During the first few minutes of our ride the roads were still paved but after a few minutes we felt that we were already jumping on the back seat of the motorcycle. Half of the road was still under construction and dusts filled our faces. At the end of the trip, a lush healthy mangrove vegetation welcomed us just before reaching the shore. Arriving at our destination, our driver asked us to which private resort we are going to check in. Since we were there for a day trip, I told him to take us to the LGU –tourism office that offers an island tour also. We asked our driver to fetch us back before 2:00 pm. I met the Britania LGU tourism officers and we chatted for a moment, and inquired on the availability of the motorized banca that would bring us to the island. The price for the whole day island tour under the Britania LGU was Php1500.00 regardless of the number of passengers (maximum of 10-15). Since we were only few, I worked on my bargaining power with the Surigaonon lad. Well, guess what? After telling them that I was an environmental specialist in Surigao del Sur and doing an advocacy to promote and boost the province's tourism, they gave us some lovely discount. Clap clap clap for all of us. As we stroll towards to our banca, we were welcomed by this long beautiful wooden boardwalk. Our boatman informed us that we will be visiting four islets: Hagonoy, Buslon, Idioran and the infamous Naked Island. There were at least 20 islands and islets off the coast of Britania. You got me by Surprise Britania! From where we were standing, we can already have the glimpse of the aggregated islets of Britania. I thought the islets would be just ordinary giant rocks standing in the middle of the sea with little vegetation and regular coarse white sand beaches. But when we reached the first islet of Hagonoy, my heart jumped out of excitement after witnessing a place I'd never been before. I was truly surprised to see this kind of place that no one would expect existing in the middle of nowhere in Surigao del Sur. No time was wasted as all of us immediately hit the beach and work on with our various acrobatic beach bumming poses in this not so common place to see in Mindanao or even in the entire Philippines. After we savored the splendor of Hagonoy Island, we sailed next to the adjacent islet, the Naked Island. It was actually a small atoll with sand similar to cake confectioneries and with mirror-like water so crystal clear. Our boatman told us that all islets were deserted with only some kind of a white creepy creatures live there, camouflaging and hiding in the ground. The moving white rocks that we have seen on the sand was actually a population of WHITE CRABS in camouflage that inhabit the island. This is just like the crabs that carried the ship Black Pearl of Jack Sparrow in the movie Pirates of the Carribean. I roamed the whole area curious if I could still find same specimen. Then one revealed itself after another and another until I got tired chasing them all. So in conclusion, the island wasn't deserted at all. We wished not to leave the beautiful place, but we have to see the remaining two other islets. Idioran Island was a little different from the last two islets. There’s a group of coconut trees that resembled to a fortress that made it look like a tropical beaches of Hawaii. But why travel too far when we already have it here . The beach wasn't that long compared with the first two islets but still it has a fine white sand that you will surely enjoy. On our last islet, Buslon, we were introduced to the three identical islets. I coined them as the islets of “Tres Marias”. Actually these islets were connected by land bridges that can be traversed during low tide (now I believe in “ice age” and ‘stone bridges’). There were no structures that can be found in the island except for the Image of Virgin Mary standing on one of the rocky side of the island. We had our bountiful lunch under the shadow of huge cliff behind us. After an hour of rest, we sailed back to the shore of Brgy. Britania. We took a shower in one of the houses in the barangay and fetched back by our friendly Habal habal driver right after. From the highway we waited for a public bus heading back to Butuan City. From Davao City bus stations, take the bus bound for Tandag City. There are only two trips heading to Tandag City in Davao, (a) 12 midnight and (b) 6 in the morning, the fare is approximately Php400 for 6 hour bus ride. From Butuan City, trips are available every hour, and the fare is approximately Php200 for 4 hour bus ride. Just inform the bus conductor to drop you at Brgy. Salvacion in San Agustin. From the drop-off point, take a habal-habal to shore of Britania to your choice of island tour facilitator. There are few resorts in the shore of Britania if you wish to prolong your stay. Each resort also provides island tours. 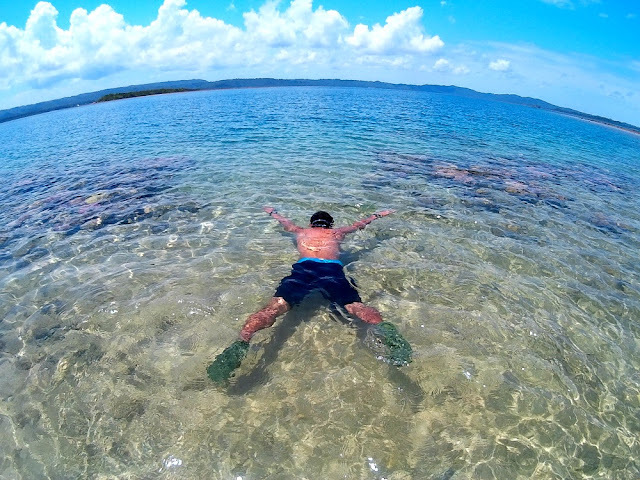 For a complete Surigao del Sur itinerary click it here. Check my next blog for an aggregated budget-friendly itinerary for the best of Surigao del Sur Adventure including Tinuy-an Falls, Enchanted River and Britania Group of Islands I will call it the Tri-Aqua-Mindanao Adventure (Falls,Rivers and Beach). it is sometimes dubbed as Mindanao's version of The Hundred Islands in Luzon. been there twice and stayed at La Entrada Resort, nice place and accomodation. kailangang mag leave ka pag pumunta ako dito ha! LOL! Whoa - another paradise island in our archipelago! And you're right, it's really paradise. I think the unpaved road helped maintain its near-pristine state. Naked Island sure looks lovely, as does the Pirates of the Caribbean crap. :) Again, I hope people will not just set up restos and resorts without any regard to the environment and scenery. Wow the place looks sa pristine and really amazing. The white crab looks really cool. There's so many places that I want to visit in Mindanao. Thanks for letting us know of these places. These are amazing pictures. It is also my first time to see a picture of the "ghost crab". Amazing. Ganda ng travel niyo po. 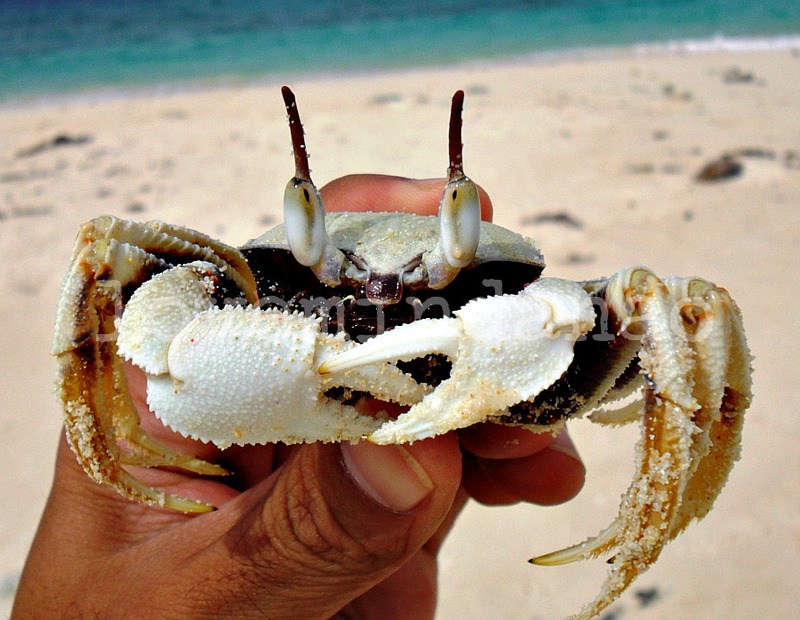 May ghost crab pala. Nice read. The pictures are amazing. I love the skies and the beach. The wooden plank is a winner, too. But the real champions are those three identical islets. Your blog is testament to the fact that there are so many places to love in Mindanao. Great pics, esp. the one of the crab. ;) I hope our local govts would prioritize infrastructure to make it easier for tourists to reach these beautiful destinations. Thanks so much for sharing about this. Never knew about this as well until now. Looks like you've definitely found paradise, Dennis! So stunning. love the photos, bro or should I say, Sir.. The Tres Marias islet have a distinct resemblance to one of those islets in my dad's hometown in Leyte only that ours' are just twin. White crabs..first time to see it.. Thanks for the online tour. Is that you holding the crab? Great guts brother. Haven't heard of this Britania place before until I read your article and saw your photos. Great shots. Waaaaa I've heard a lot about Britania!!! Very nice jud daw dira. Gonna explore this part of Mindanao. Believe it or not, wala pa ko kaadto dira! Britania Group Of Islands are such enchanting and inviting destinations. The photos just proved that these beaches are naked paradise that should be embraced with a lot of tourists. It's nice to see how rich the natural resources on Surigao is. I hope that the Government together with DOT, DILG and DPWH give priority on the infrastructure therefore many tourist will be able to visit this wonderful place that will benefit the locals. I like how the place as is. Huwag lang sana mapunta sa mga kurakot na opisyal ang pamamahala sa Britania Group of Islands. beautiful capture of nature! a perfect place to relax and unwind....the beach...I've heard of the beauty of hagonoy island but i haven't got the chance to really see it.. hhhhhmmm perhaps next year. The Britania group of islands are so beautiful. It's a must visit when in that area of Mindanao. I love the crab pic, its like a snowstache! hahahahah! Thjis just makes you proud to be a Filipino, we beat other countries with our numerous beaches - which are by the way stunning! Hi! For some other options, you can come and stay overnight at Oasis Rest House at Britannia, San Agustin, Surigao del Sur. We offer you air-conditioned room accommodation, island hopping, and catering. Visit and like our page in facebook, Oasis Rest House. Contact no. 09107529319. Wow, that beach is stunning! I am so excited to do more traveling in Mindanao once we've settled down maybe next year. And will definitely come back to these posts to use as guide. A good read about Britannia Islands and nice photos, too!